“The Scream”, the Norwegian Evard Munch’s painting, and “Double Elvis”, Andy Warhol’s painting of the superstar are up for sale! 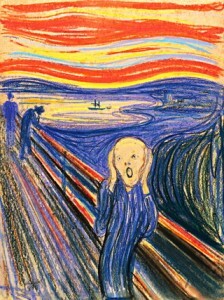 Known as the Mona Lisa of our time, “The Scream,” painted in 1893, is an icon of modern art. Today the image has come to symbolize to some as the fear and anxiety that confronts us in our contemporary world. The painting is expected to sell for over $80 million. Go ahead and scream if you want to! It was 1956 and there was definitely some screamin’ goin’ on! The screamin’ was done by Elvis Presley’s fans (mainly teenage girls, of which I, your devoted blogger, was one) over his enormously popular and controversial performance of “You Ain’t Nothin’ but a Hound Dog.” Critics were outraged but Elvis was destined to become the “King of Rock and Roll,” and the best selling solo artist in the history of popular music. “Double Elvis” is a breath-taking moment in Art History. Painted by Andy Warhol, superstar artist, the work is a silkscreen..simply a blown up photograph glued on silk and painted with ink. Elvis, the man and the legend, stares at us down the barrel of a gun; the lone cowboy confronting the great American frontier. 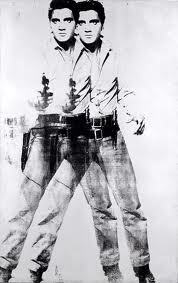 “Double Elvis” is expected to sell for $50 million. Now, let’s all scream! Watch “The King of Rock ‘n’ Roll! Those are definitely 2 paintings worth screaming about. I have a question about “The Scream.” I haven’t seen it in person, but from the photo it looks like it’s pastels or chalk – it it really oils? Just curious. And that’s what you do best, Kirby – arouse curiosity. It’s hard to believe that painting was from 1893. It looks so contemporary. PS: In my day, we were screaming about the Beatles. Thank you for sharing these cultural pearls of wisdom. Keep ’em coming. I no longer regard the Scream as ironical or even satirical as I once did. The Scream is within us all and the image is easily deciphered without owning the origional. Kirby, I went to see Elvis at the Colliseum in Houston. I wanted to scream, because the thousands of teenage girls did NOT stop screaming and moaning and practically falling down in response to Elvis. I never heard a word he sang or even the music itself. But at least I can say I breathed the same air as Elvis.